Plaza is a wooden framed bed that is made in Italy. This bed comes with or without storage and has a headboard padded in eco leather. 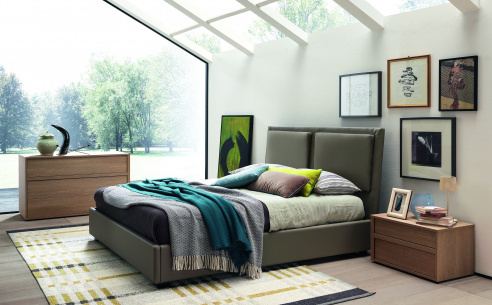 The wooden frame is available in a walnut or thermal oak finish and has curved edges with the feet on the non-storage version are set towards the middle of the bed to make them less visible. As the storage version has no feet the frame goes down to the floor, this provides a storage base interior height of 19cm. The storage compartment itself is easily accessed by lifting the slats and mattress with the help of two internal gas pistons. Please choose a colour from the chart and selct the category from the drop-down menu. Once you hve purchased your bed a member of our team will contact you to discuss the colour.